So, why is there so much emphasis on breathing in meditation & mindfulness? What do you know about meditation? The word may conjure up images of someone sitting quietly in the lotus position or cross legged on the floor. You might like to add images of the Buddha and incense to the picture along with a few sound effects … the gentle sound of gongs or the sound of the word Ommm … These can certainly add to the meditation experience but don’t tell the full story. Meditation teachers often tell new students to focus on their breath in the belly. This is because a lot of meditation practices involve narrowing down focus to an ‘object of concentration’. When we pay attention to something specific it has the effect of quietening the mind – all that busy frantic thinking diminishes a bit. It is a bit like being ‘in the flow’ of an activity where nothing else can disturb you or grab your attention. The breath is often used as an object of concentration because, very handily, it is always available, and is completely portable and free – so no special equipment is required! The first benefit of focusing on the breath is that our minds gets a bit calmer and, let’s face it, we can all do with more inner peace and clarity. However, there is a more profound reason why there is so much emphasis on breathing. For this to happen, we use 3 sets of muscles – the intercostals, the diaphragm and the abdominals. The intercostals (by the ribs) move in and out, the diaphragm and abs move up and down and so the lungs function. The diaphragm and abdominals are very sensitive to stressors. When we find ourselves in a difficult situation they freeze and this causes tension which affects our breathing. The result is that the breath becomes shallow and the intercostals have to work a bit harder to get your lungs to function. 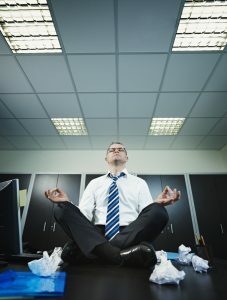 When we lead busy stress filled lives this style of breathing can become a habit. The important thing here is that breathing affects the nervous system and different breathing styles have different psychological effects and vice versa. There is a 2 way feedback loop between our minds and bodies which means that not only is breathing affected by our moods but our moods are affected by our breathing. Let’s look at the 2 different types of breathing and the effect they have on the body. Thoracic breathing (which emphasises the intercostals) over stimulates the sympathetic nervous system whose job it is to prepare the body for emergencies – and this type of breathing is associated with the body’s natural stress reaction. This is sometimes known as the ‘fight or flight’ response. So when we breathe in a shallow way we are telling our minds that we are in danger. Abdominal or full diaphragmatic breathing has a very different effect on the body. When we breathe deeply down into the belly we are telling our minds that we are safe. This means that the body’s natural relaxation response swings into action. You might notice a slower heart rate and lower blood pressure. Deep breathing also stimulates good blood circulation, the flow of lymph is improved, and this can help prevent illness and infection. Our amazing mind/body connection means that poor (shallow) breathing can create a state of anxiety and panic while deep (full) breathing influences the mind and body to calm down. The important thing to remember here is if we habitually engage in shallow breathing we are telling our minds that we are being threatened whereas deep breathing sends the message that we are safe and well. So when your meditation teacher tells you to focus on breathing the benefits will not only be improved focus but also a deep sense of calm and peace in both the body and mind.